Storage. It seems to be an issue in even the roomiest ofhomes. So how does one conquer a lack of storage while still creating a home that feels more like a home, and less like a shed? 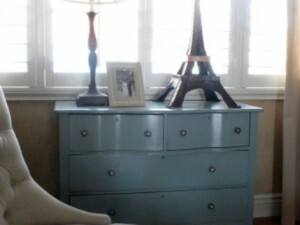 Try using these three hard-working and versatile pieces that look as good in a living room as they do in a bedroom. I’m Designer and Quilting Radio show host Pat Sloan! I’m delighted to be writing the crafting column for Fifthroom Living this year. As the weather starts to change and spring is just around the corner everyone is looking forward to revel in the sunshine, entertaining family and friends or simply reading a good book. 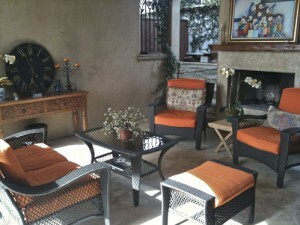 The design trend is to transform your style inside out by decorating the outdoor living spaces. A harmoniously designed outdoor retreat is a powerful method to add some structure and purpose to this ‘additional’ room in your home, as you create a seamless flow from the interior to the outdoors. We’re taking another trip into outdoor living paradise by designing an outdoor room inspired by French Romance. While bringing Paris’s Eiffel Tower to your backyard may be a little tricky, using some simple tips and design cues will give your outdoor living space French flair. One of this year’s hottest trends for outdoor living is recreating Mediterranean gardens and landscapes right in your own backyard. Combining the graceful elements of the Italian Renaissance with the rustic charm of enchanting Tuscany farms creates spaces that are serene and peaceful; your space will boast refined style, while remaining incredibly accessible.